Today let's take a little trip down memory's highway and tip our 40s to the awesome but short lived GLAMROCKER period of Brian Warner, aka Marylin Manson. In a weird way, I think I started to get more of an appreciation for fashion's hilarity when this record came out. First, the songs are sort of amazing, and secondly...Manson was KILLING IT with this look. No one was really going all weird at this point; I remember watching his perfomance on the MTV Music awards that year (99) and giggling with DELIGHT because it was so over the top and FUN. and FUNNY. I SPY A RAZORBLADE RING! 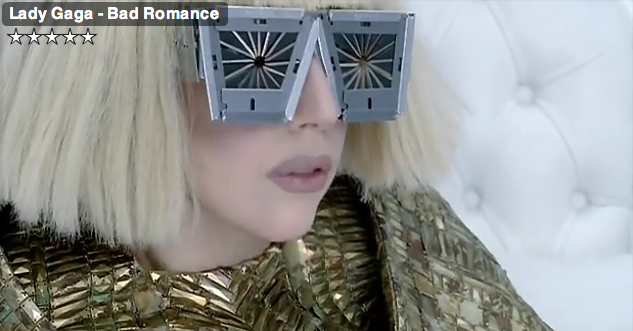 PAGING GAGA? LET'S DO ONE OF THOSE CGI DUETS WITH MANSON THEN AND GAGA NOW. BFFS! It's the same way I feel about Gaga...they are basically living out an elaborate art project that is here to make us all laugh and have a good time. And, I suspect, it is way to amuse THEMSELVES. This era was not too well received and good ole MM has gone back to being a white-faced wonky eyed Satan-loving creeper of the darkness. Which..is fine, I guess, except I prefer Platform latex boots and chola lipliner. It's much more fun. Please listen to this all day today, I am gonna. And the next time you do karaoke, consider writhing on the floor at your dollar-a-song joint of choice while you whine: THE DRUGS, THEY SAY, ARE MADE IN CALIFORNIAAAAAA...it will probably get you a standing O.
i watched his videos a few months ago too, oh man i used to LOVE him so. Oh this is so good. I have not seen that video in years. MM was such a huge influence to me as a young teenager and into my late teens. I saw him during the Mechanical Animals tour , and seriously was the best show I have ever been too. MM, Hedwig, Madonna, Bowie, NY Dolls were also a huge influence on my fashion ! Ahh, I must go put on MM now! ahh I miss the days of MM. I grew up with the bassplayer's brother. So many fond memories of hearing them rehearse in a garage. I've been on an mm kick for about the past year. I remember when mechanical animals came out, I musta been like 10 or something and my dad snuck the cassette tape to me because my mom didn't like his "satanic ways". I guess this is more of a comment about how my dad rules, but mm is def still the man. 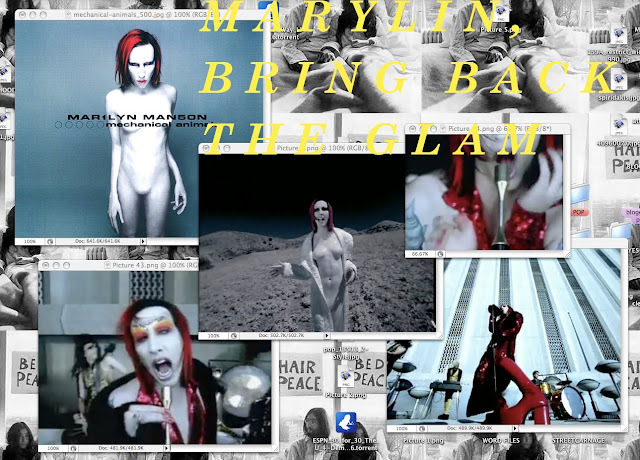 I am such a huge fan, especially of the older stuff (even had their first cd) - yes bring back the glam - love ya MM! Apparently him and Evan Rachel Wood are getting married now...? Hmmm, she's basically my age.... w/e as long as they're happy! On Perez Hilton there's a MM/LG duet somewhere !! I LOVED him in high school, and honestly, I still kinda do. I have a friend and he only listens to Lady Gaga, Britney Spears, and such. For his birthday, I gave him MM's latest cd, The High End of The Low (he does look a little like lady gaga on the cover). My friend thought I was mocking him, but I was only trying to expand his horizons. Sigh. Ahhh I love this blog. You've completely revved up my 90s obsessions all over again. Thank you! "It's the same way I feel about Gaga...they are basically living out an elaborate art project that is here to make us all laugh and have a good time. And, I suspect, it is way to amuse THEMSELVES."